Is it possible to remote sense salinity with sea ice? "Since no SMOS SSS can be derived over sea ice, only grid points with sea ice fraction lower than 30% have been used when comparing TOPAZ and SMOS SSS"
Thanks for that RTG. Any examples from the 400MB data? I'm a bit tight on broadband volume and would need to budget for that. Detailed view of part of the dark line north of Greenland in polarview before it hits the Fram Strait. Fairly sure now that it originated in the Laptev as shown. That animation would sure seem to suggest that the transpolar drift is alive and well. All the whoi ITP buoys are heading north. 104 has gone off the map, 105 shortly to follow, hopefully not taking all the fresh water with them. Looks like 107 has some interesting data when it settles down. 109 and 110 sticking above the warm patch. update on mercator 0m salinity jul2017-feb2019. An amateur attempt at visual identification of ice thickness using a comparison of ascat with an overlay of piomas thickness contours created using ImageJ edge detect for 2018. Best efforts at scaling and alignment. Missing ascat days have been duplicated with nearest days. Poor data days remain for continuity. Off topic but posting here for reference. An even rougher attempt at visualising whoi ITP107 . The charts are made using octave and I think they are accurate, though they need some tweaking, but scaling and alignment with ascat are by eye for now. Other ideas are in the pipeline. It looks like itp107 is struggling a bit at the moment. Turbulence or lost its tether? That is a great presentation, Uniquorn. The Gyre beneath is surely strengthening thanks to the strong drift in the right direction this winter. Yes the temp /salinity contours are not working right now on itp 107 but sometimes the profilers come back. The gyre is certainly cranking compared to last year however. Thanks for all the work uniquorn ! Thanks for the encouragement. My attention to detail is so poor that I didn't notice ITP109 was only reporting location till I ran the numbers, so here is ITP110. 103-105 data is different format so I may have a rethink about presentation before going further. Any ideas how to accurately locate lat,long onto ascat? Edit: Part of the motivation for putting these animations together was the large salinity drops in the profiles like those around day330 below. I had thought they were sensor problems but looking at the data like this I don't think so. Johnm33 suggested they were currents. That event does coincide with a rapid change in direction though. Thanks for these animations of the bouys motions, tracking them and looking for some surface signs of the salinity changes is exactly what I've been thinking about. Fwiw I've persuaded myself that these changes are happening from below, a sign of accelerating Atlantification. Currents into Barents are increasing[?] forced by tides[?] and slp, when these waters fall into the deep they are generating waves in the deeper layers, so if they fall off the shelf the waves caused are more or less parallel to lomonosov and arrive to wash up the shelf on the Canadian/Alaskan side, mixing the layers and causing the +/- parallel waves that wash back in the surface layer. As these wash back they're heading straight back towards the rotational axis and gain rotational energy almost as fast as they dissipate it churning the ice. If the waters wash into the StAnna trough they force their way into Laptev generating deep waves which can travel all the way to Banks/Amundsen, they generate some backwash from the shelves giving some interference patterns more or less at the 'focal' point of the curved shelf structure and are interfered with by the parallel waves coming from the shelf. It may be that the bouys are being damaged by deep waves travelling in different directions causing stress in the lines beyond their design limits. With the full moon and the present low slp in Barents we're probably going to see another series of unusual waves in Beaufort in a few days time. johnm33, agreed about the changes from below. The results of the last cool(ish), cloudy summer probably confirm that. At what speed do the waves in the deeper layers travel? Yes, I noticed those bumps at the bottom, though quite often they are smoothed. I'll run the numbers on 104 and 105 and see if I can line them up meaningfully. Posting the following mp4 to show how inaccurate the previous attempts at bouy locations may be. I took less care to line them up this time as the projection is clearly wrong. The background is quite good though. I think octave does plot polar stereographic projection, struggling to find out how. Only showing salinity here from 250m (dbar) to 800m to show more detail at depth. The 2 day pulse may be related to up and down profiles. First animation shows all data, up and down are labelled. Second animation shows only up data with the 2 profiles overlaid inset at bottom right. They appear to show a layer at 350m-450m pretty well. Click on the images to run. Heat transport to the Arctic slideshow from National Oceanography Centre. Mercator model doing quite a good job matching 34m temperature to Suomi npp/viirs on the atlantic side, feb26. No link, I guess the navy mainly operates in the Beaufort. I continue to be amazed by the depth of the Pacific Warm Water layer as evidenced by itp 110. If compared with two completed itp missions itp 78 or itp 85 we can clearly see the difference with current Beaufort conditions. Does anyone have any idea how this extra heat and volume will dissipate ? <>Does anyone have any idea how this extra heat and volume will dissipate ? 1. It's a 'one off' that slowly fades away by mixing, adding to general AGW. 2. It's perennial and layer thickness and temperature increase yearly, eventually warming surface layer and reducing ASI. 3. Without the thick ice 'governor' the gyre spins up to unstable speed, the freshwater layer slips off into the CAB at the end of the melting season and freezes in place up to 20m thick. The warm layer radiates into space in clear skies and gives us another 10 years to save the planet. Marvel make a film about it. edit: incoming from bering/chukchi or upwelling? I'm reading the 'intrusions' in the temp./sal. contour plots as waves happening in the deeper layers. The lack of sea ice over Barents, which I suspect acted as a baffle, is allowing ever increasing volumes of Atlantic waters to fall into Santa Anna trough or down the face of the continental shelf, likely enhanced by tidal forces these waters arrive in pulses and are the cause of the deep waves. Looking at 107 I'm reading the white intrusions as off the scale, not faults, it's very difficult to guess the direction of the waves but if they originate from the Barents side they will wash up against the shelf somewhere on the US/Canadian side, and when they do some mixing must occur. 107 actually seems to show a vertical vortice penetrating well into the deep, a much more dynamic mixing than anything that can be seen at the surface. If we have more Atlantic water penetrating into the Arctic then it will drive out the easiest fraction of the water there, the fresh surface layer. I don't think the white areas are off the scale. It looks like the profiler stops moving up and down the wire, possibly because the current is too strong. With its proximity to the Chukchi, isn't it more likely that the latest currents are related to the pulses from the Bering? wire angles develop and drag forces on the profiler are increased. climb the wire against the current, making the maximum depth of the tether moot. Here looking at the path of whoi ITP107, data in previous post, overlaid onto Mercator 34m salinity. Still some inaccuracies in the scaling (shown in the final frame) as lat/long hasn't been converted to the correct projection yet. Apparently not as close to the choppy Chukchi waters as I had thought, if Mercator model is correct. Good news if it goes round again (and the traction drive is ok). On the pulses being from Bering, it's possible but the strait is shallow limiting the volume passing through, Pacific water is less saline so is less inclined to sink, then there's the complex bathymetry to dissipate any surge unless it breaks through north of Barrow. The periodicity of the waves bears no resemblence to the tidal surges and so must result from another dynamic I'm thinking of wave harmonics in the basin(s) on the Barents side of Lomonosov causing surges breaking through either at Lincoln or Laptev and sometimes over the ridge directly, that's simply because it's hard to see where else the series of parallel[+/-] wave forms could evolve. Looking at hycom salinity the break-up of Pacific waters show, and if you zoom in there's some type of waves being generated breaking through the surface and radiating away from Laptev. Yes, thanks, the Bering Strait is too shallow. ITP110 shows the most regular disturbances at depth. 20-30 day intervals. That could also be due to circular drift over relatively stable currents though. It occured to me later that the surges coming through from Bering might be responsible for the turbulence/vortice that [i think] happened to 107. Looking at the bathymetry there's a cut close to the coast which would channel the water. I suspect that when surges come through they behave a little like slime, hard to get them moving but once established the movement accelerates for a while then peters out. The "slime" body all has a similar energetic potential so when it meets the Beaufort gyre the two interact to create vortices. There's some evidence on amsr2 polarview of a streak more or less flowing out from where the channel is around 08:02 and again now so should be a good test of the idea. Thanks johnm33. A suggestion to look at density led me to the ocean water density calculator. Millero, F, C. Chen, A Bradshaw, and K. Schleicher, 1980: A new high pressure equation of state for seawater, Deep Sea Research, Part A, 27, 255-264. The build up in temperature from 40-100m in some areas speaks for itself. It's above my pay grade to comment further. No idea if i've just missed this before but definite signs of harmonic waves and breakthroughs in more or less the places the bathymetry would indicate. Given it's gyrations no reason not to think some/all of the intrusions 110 shows are vortices too. Above my pay grade too, I am not as fascinated by the heat pulses (all kinds of dragons down there it seems, jets, vortices and whatnot storing heat excess) but how nice and stable the lens of fresher cooler water seems over all that time and locations. I wish these data had been captured in part under the 2012 or 2016 GACs, only thing with strength to disrupt that layer with thin or scattered ice. ok, no paygrade excuses then or we all get a rise . I looked at itp53 http://www.whoi.edu/page.do?pid=157836 which is a prime candidate for 2012, but it requires a bit of recoding as the file format has changed. It would be interesting to compare though. Regarding the lomonosov ridge there have been many parallel fractures this freezing season. I didn't notice them so much last year and viirs brightness temps aren't available before then. They would have to be pretty big to show up on ascat. I guess that mixing is more likely to occur with shallow density gradient. I've been looking at 105 again. It's situated in water about 3650m deep if the white intrusions are off the scale vortices how likely is it that they'?' reach almost another 3km deep? Perhaps they are large bodies of 'native' deep Fram basin waters forced over Lomonosov by either wave action or surges from Santa Anna trough. The separation of the various fractions of density/salinity around the cores is exactly what one would expect from vortices. Is it one vortice that the bouy makes repeated passes through though? Whatever thats a huge amount of water to be moving coherently away from the axis of rotation. Some data for whoi itp105. It appears to be programmed to collect 3 profiles down to 250m then 1 down to 800m if it has time or doesn't have a problem. That makes it tricky to match up dates with my simple coding skills so I haven't attempted to combine much. 3. Temperature and salinity from 0-250m. Had to go to mp4 to keep the size down. edit: last profile was mar9. Hope it comes back.. Forgot whoi itp105 location and profile. The salinity depths at mercator suggest it's more likely that the vortice water 'bodies' are coming in from the direction of Lincoln sea, along the shelf, then, given the density of the water, sliding down to follow contours into the deep. Perhaps as they evolve they become first more bell shaped and then ovoid discs as they lose spin thus sucking down water even as they move south into Beaufort, at least that's the best guess I have for the down-draughts on 109-110. I was checking out Copernicus too, 001 024 amongst others, they suggest that CAA has been 'colonised' by Atlantic water at depth, part of the same inflow leading to the vortices, I wonder if that has led to the build up of the Beaufort 50-100m warm layer, only the top freshest layer escaping above it? and yet Baffin so far shows little sign of warming. I had hoped that showing the data in a different format would clarify what is happening between 300-800m but I can only see that some event occurs and the sensors get stuck on the line. Possibly turbulence but no measurements. This looks interesting though data is only up to 2015 and it concentrates on 0-150m. Greater role for Atlantic inflows on sea-ice loss in the Eurasian Basin of the Arctic Ocean. The deep winter ventilation and the disappearance of the CHL in the eastern EB (eastward from Severnaya Zemlya, >90°E) at several mooring sites in 2013 to 2015, however, are unprecedented (Figs. 3A and 4). 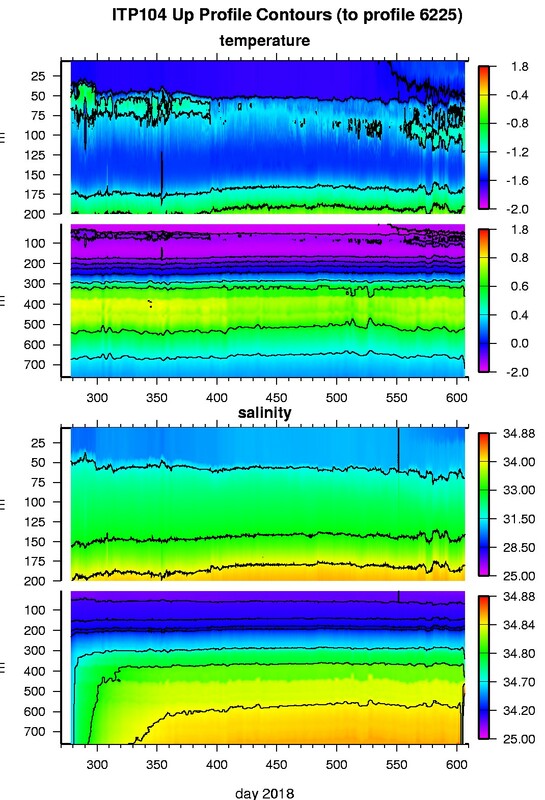 Substantial changes in seasonal heat content Q (see definition in the supplementary materials), driven by surface cooling and salinification during winter sea-ice formation, occurred in the upper 130-m layer at M3e, M13, M16, and M6b mooring sites. 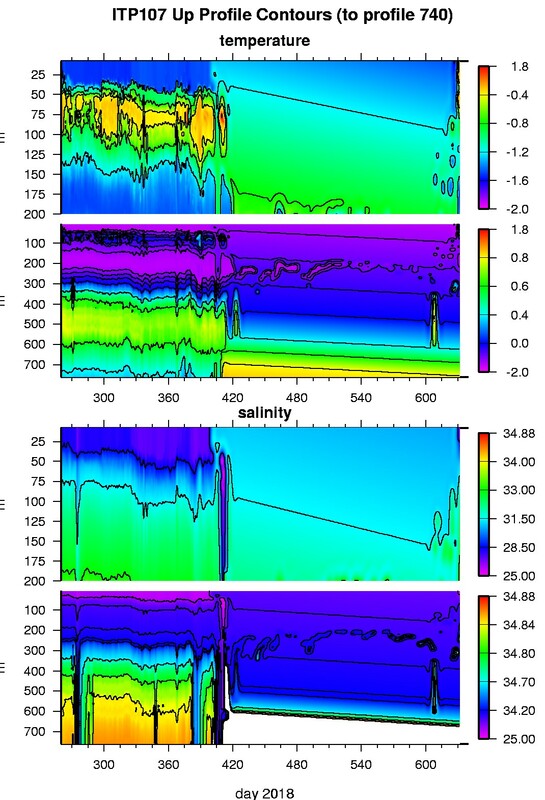 If this trend persists, convectively driven winter development of the deep (>80 m) SML, combined with ventilation of the upper 130-m ocean and associated disappearance of the CHL would represent a fundamental change, with the eastern EB water-column structure becoming less stratified and susceptible to further mixing. Whilst there's some signs of pulses in other years they aren't persistently delivering turbulence along Lomonosov towards the pole. Mercator 30m salinity, difficult to pick out but the same pattern is showing just east of 120E, again delivering pulses towards the pole, and spilling Atlantic water over the ridge.I think. Is there a 3d representation of arctic ocean topography/bathymetry anywhere? Update on the whoi itp buoys. Some caution is needed with the animation as some of the profiles stopped being received some time ago, particularly itp89, included for the drift path, itp103, 107, which has been stuck for a while, and itp109. The 3 northernmost buoys still drifting steadily northwards against the annual drift. Try the Arctic Maps thread [another here and down-thread, including the most recent post]. Of course, an internet search for "Arctic Ocean Bathymetric Map" will come up with more. Thanks Tor. I found this one that helps (me) visualise the scale of the depth of the basins and where deep waves are most likely to cross the Lomonosov Ridge. It's quite good for the Fram Strait too. No scale but I can find depths elsewhere. Looking at 107 there seems to have been a large scale 'sea change'. After the idea that the Atl. waters coming through Fram may be responsible for the vortices passing 104/5 and that with 105 there was a distinct possibility that this Atl. water was reaching into the deep to follow the contours I followed the 'deep' and found it ran very close to the western side of the Canada basin approaching the continental shelf close to 155w. That makes some sense given the surface waves propagating more or less parallel to the shelf thereabouts recently but it also indicates the [possible] arrival of Atl. waters beneath 107 . The 'off the scale' white at depth may indicate the arrival of large amounts of Atl. waters for a much longer period, given the persistence of the change I'm guessing that the energetic potential of the Atl. water is keeping it tight to the western edge of the basin, even so this seems to be quite a significant change. itp107 has only been able to move short depth changes between 200m-350m since day58 (423 on the chart I think) and sporadic for a some days before. The chart doesn't represent that very well. Thanks johnm33 for making me run the numbers again on itp107. Apologies for bad scaling on salinity for days 45-46. Screenshot of data for day45. There is a lot going on down there. It's a shame the sensors can't move enough to show it. whoi-itp107 salinity 2019 day21-81 speeded up to show the anomalies.